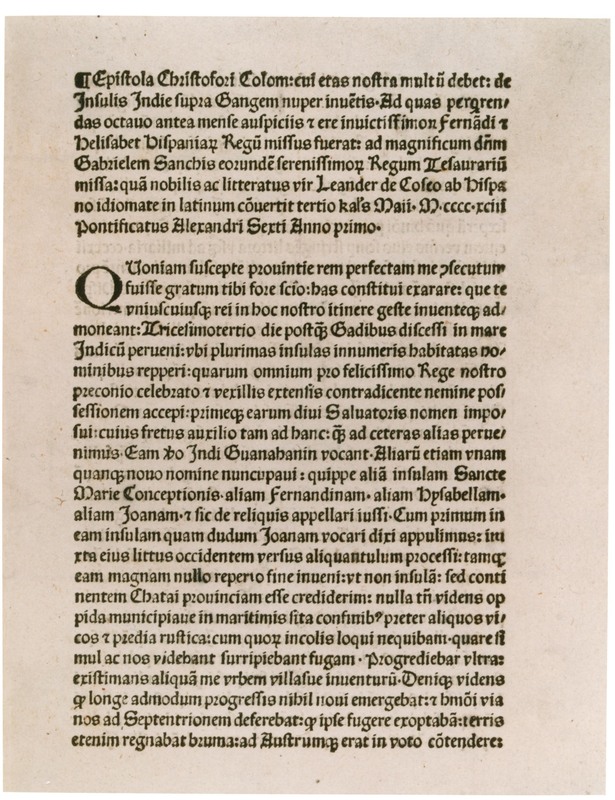 Columbus’s letter on the first voyage is the first known document announcing the results his voyage that set out in 1492 and reached the Americas. The letter was ostensibly written by Columbus himself, on February 15, 1493, aboard the Nina, while still at sea, on the return leg of his voyage. [ A post-script was added upon his arrival in Lisbon on March 4, 1493, and it was probably from there that Columbus dispatched two copies of his letter to the Spanish court. The letter was instrumental in spreading the news throughout Europe about Columbus’s voyage. 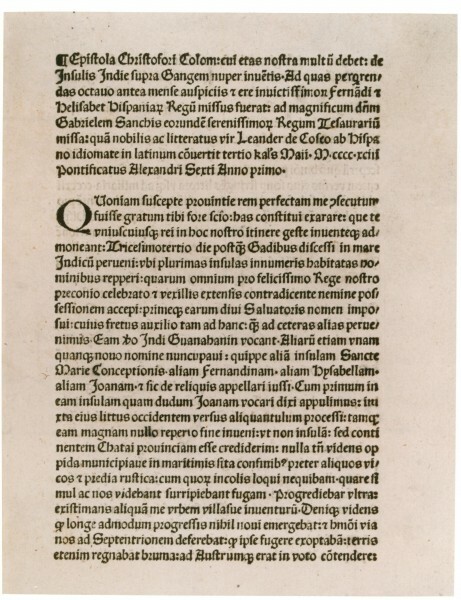 Almost immediately after Columbus’s arrival in Spain, printed versions of the letter began to appear. 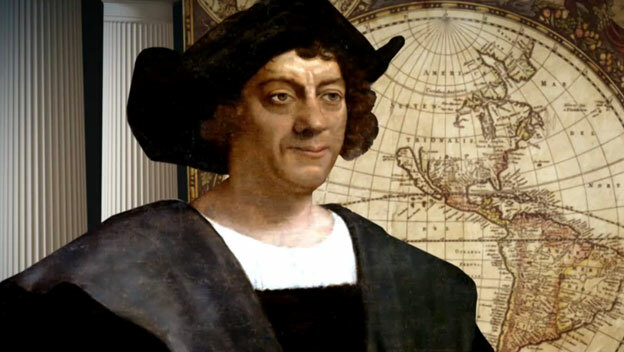 In his letter, Christopher Columbus claims to have discovered and taken possession of a series of islands on the edge of the Indian Ocean in Asia. He described the islands, particularly Hispaniola (today the home of the Dominican Republic and Haiti) and Cuba. exaggerating their size and wealth, and suggested that mainland China probably lay nearby. He also gave a brief description of the natives, emphasizing their docility and amenability, and the prospects of their mass conversion to Catholic Christianity. In the letter, Columbus urges them to sponsor a second, larger expedition to the Indies, promising to bring back immense riches. I have determined to write you this letter to inform you of everything that has been done and discovered in this voyage of mine. On the thirty-third day after leaving Cadiz I came into the Indian Sea, where I discovered many islands inhabited by numerous people. I took possession of all of them for our most fortunate King by making public proclamation and unfurling his standard, no one making any resistance. The island called Juana, as well as the others in its neighborhood, is exceedingly fertile. It has numerous harbors on all sides, very safe and wide, above comparison with any I have ever seen. Through it flow many very broad and health-giving rivers; and there are in it numerous very lofty mountains. All these island are very beautiful, and of quite different shapes; easy to be traversed, and full of the greatest variety of trees reaching to the stars. . . . In the island, which I have said before was called Hispana, there are very lofty and beautiful mountains, great farms, groves and fields, most fertile both for cultivation and for pasturage, and well adapted for constructing buildings. The convenience of the harbors in this island, and the excellence of the rivers, in volume and salubrity, surpass human belief, unless on should see them. In it the trees, pasture-lands and fruits different much from those of Juana. Besides, this Hispana abounds in various kinds of species, gold and metals. The inhabitants . . . are all, as I said before, unprovided with any sort of iron, and they are destitute of arms, which are entirely unknown to them, and for which they are not adapted; not on account of any bodily deformity, for they are well made, but because they are timid and full of terror. . . . But when they see that they are safe, and all fear is banished, they are very guileless and honest, and very liberal of all they have. No one refuses the asker anything that he possesses; on the contrary they themselves invite us to ask for it. They manifest the greatest affection towards all of us, exchanging valuable things for trifles, content with the very least thing or nothing at all. . . . I gave them many beautiful and pleasing things, which I had brought with me, for no return whatever, in order to win their affection, and that they might become Christians and inclined to love our King and Queen and Princes and all the people of Spain; and that they might be eager to search for and gather and give to us what they abound in and we greatly need. Tagged christopher columbus, Politics and History.